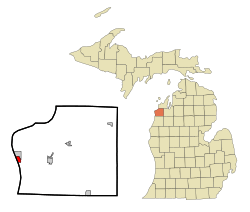 Elberta is a village in Benzie County in the U.S. state of Michigan. The population was 372 at the 2010 census. The village located in the east of Gilmore Township, on the south side of Lake Betsie, which is formed by the Betsie River before flowing into Lake Michigan. The village is on M-22 just south of Frankfort. M-168, previously one of the shortest state highways in Michigan, extended 0.95 miles (1.53 km) from a junction with M-22 in downtown Elberta to the former Ann Arbor Railroad ferry docks in Elberta. Elberta was first settled in 1855 and incorporated as South Frankfort in 1894. It was renamed Elberta in 1911 for the local Elberta peach. The village's founder is said to be George M. Cartwright. According to the United States Census Bureau, the village has a total area of 0.99 square miles (2.56 km2), of which 0.74 square miles (1.92 km2) is land and 0.25 square miles (0.65 km2) is water. The downtown is at . Elberta is part of Northern Michigan. 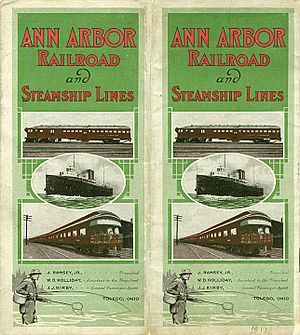 These Ann Arbor railroad cars and steamships would have been familiar sights in Elberta in 1911, when this timetable was printed. As of the census of 2010, there were 372 people, 173 households, and 101 families residing in the village. The population density was 502.7 inhabitants per square mile (194.1/km2). There were 229 housing units at an average density of 309.5 per square mile (119.5/km2). The racial makeup of the village was 95.2% White, 0.8% African American, 0.8% Native American, 0.3% Asian, 0.8% from other races, and 2.2% from two or more races. Hispanic or Latino of any race were 3.5% of the population. There were 173 households of which 22.5% had children under the age of 18 living with them, 42.8% were married couples living together, 8.1% had a female householder with no husband present, 7.5% had a male householder with no wife present, and 41.6% were non-families. 34.7% of all households were made up of individuals and 13.8% had someone living alone who was 65 years of age or older. The average household size was 2.15 and the average family size was 2.71. The median age in the village was 47.8 years. 18.5% of residents were under the age of 18; 7.5% were between the ages of 18 and 24; 19.2% were from 25 to 44; 33.1% were from 45 to 64; and 21.5% were 65 years of age or older. The gender makeup of the village was 51.9% male and 48.1% female. As of the census of 2000, there were 457 people, 190 households, and 124 families residing in the village. The population density was 612.9 per square mile (235.3/km²). There were 237 housing units at an average density of 317.8 per square mile (122.0/km²). The racial makeup of the village was 95.62% White, 0.66% African American, 1.31% Native American, 0.22% from other races, and 2.19% from two or more races. Hispanic or Latino of any race were 0.88% of the population. There were 190 households out of which 31.6% had children under the age of 18 living with them, 44.2% were married couples living together, 15.8% had a female householder with no husband present, and 34.7% were non-families. 28.9% of all households were made up of individuals and 10.0% had someone living alone who was 65 years of age or older. The average household size was 2.41 and the average family size was 2.90. In the village, the population was spread out with 29.3% under the age of 18, 6.8% from 18 to 24, 28.7% from 25 to 44, 20.1% from 45 to 64, and 15.1% who were 65 years of age or older. The median age was 36 years. For every 100 females there were 96.1 males. For every 100 females age 18 and over, there were 94.6 males. The median income for a household in the village was $28,403, and the median income for a family was $31,250. Males had a median income of $27,159 versus $21,806 for females. The per capita income for the village was $13,594. About 9.0% of families and 10.7% of the population were below the poverty line, including 13.6% of those under age 18 and 6.7% of those age 65 or over. Elberta, Michigan Facts for Kids. Kiddle Encyclopedia.